The traditional ways of managing inventory are outdated. This is the age of the Smartphone! Through progress in technology, we can now track inventory conveniently and effectively using our smartphones. Often due to confidentiality issues, companies provide their workers with smartphones specifically for office use. This eliminates hardware costs and, in turn, provides employees with easier and the ability to manage the system remotely at any point in time. The app pertaining to inventory management is easily accessible and can be downloaded by the workers on their smartphones which thus reduces the hardware cost considerably. Technology improves with every passing day. We have seen the transition from ID barcodes to RFID scanning. Previously, companies who purchased new technologies in inventory management to replace their traditional hardware systems would be required to continuously update their system. In contrast, mobile apps allow the users to install and upgrade their devices without any extra charge. The setup of a traditional hardware-based Inventory Management System can be extremely time consuming. It involves purchasing the latest hardware and devices compatible with the same. Subsequently, you have the herculean task of training the staff to use these devices. Mobiles are devices that each one of your staff members would be familiar with, therefore there is very little training required on how to operate it. After the apps are installed in the phones, which is an easy setup process, training would be a simple process. By implementing this system, can you imagine by how many folds the productivity increase would be? Workers always carry their smartphones with them. These apps can be accessed from any location at any time. Your staff in the field would be constantly updated with the latest information, as the data is accessible real-time while all the staff members connected. Those who require it would be able to access and manage the system on the go; including ease of scanning data at remote locations, tracking products, asset verification and so on. It would give you the upper hand over your competitors who still haven’t overcome the fear of accepting the new system. Technological developments have reached a point where most of the storage of mobile applications are cloud-based. In such cases, the data stored in the cloud ensures higher security. Despite several workers having access to the apps remotely, the confidentiality of the data is maintained. The system is subject to regular updates and automatic maintenance. The cloud-based mobile apps neither have any hidden charges nor require installation of any new software for this purpose. This model allows incorporation of inventory management with existing warehouse as the back-end system. Go paperless, go green! You need not stack your desks with papers to keep records. Transactions can be printed if required. 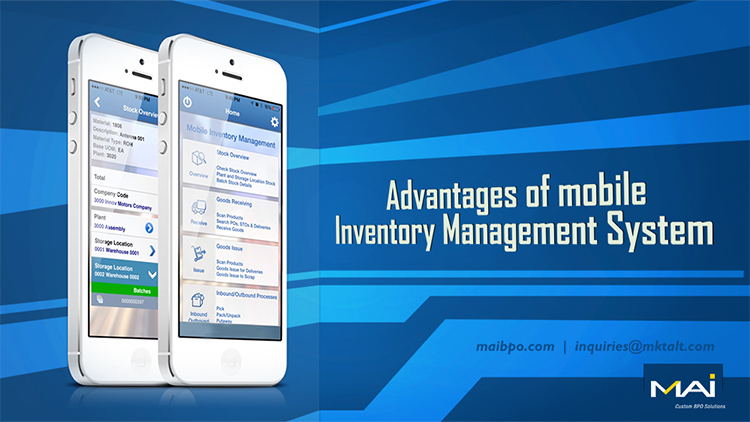 Here we have discussed few of the many advantages of Mobile Inventory Management. Embrace technology and reap the benefits. Let this be a stepping stone for the success of your company!